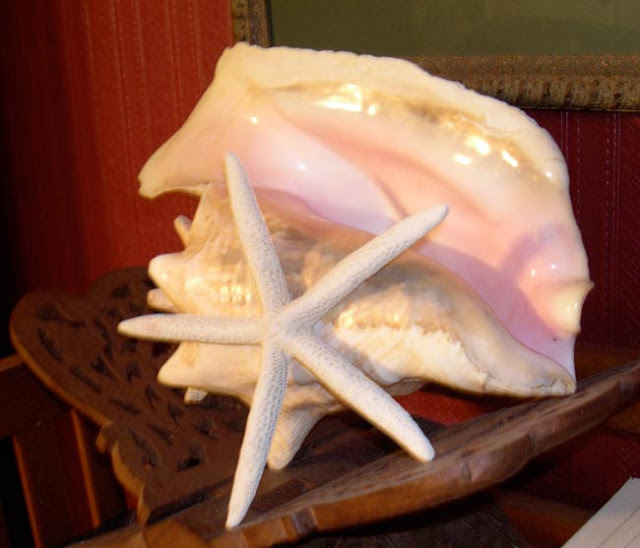 Most of you know that I have a passion for seashells and I've shared many photos of the ones around my home. Today I thought I'd show you two of my favorites, both are equally gorgeous in my eyes. Isn't it a beauty? Queen conch has been listed in CITES (Convention on International Trade in Endangered Species of Wild Fauna and Flora) since 1992 and in Florida they are listed as a protected species, making it illegal to gather any specimens. Collecting live shells is a BAD thing! If you pick up a shell and it has a critter living inside, please admire its beauty and then gently replace it in its natural environment. So, how did I end up with this specimen you ask? In 1985, I was vacationing in Jamaica and one day we went out on a glass bottom boat for an afternoon of snorkeling. The water there is clear and beautiful. I spotted this conch on the bottom and dove numerous times until I brought it to the surface. Yes, the conch was still alive! Before I could say anything, the captain of our boat took the shell from me and with a wire extracted the flesh lickety-split and proudly handed the empty shell to me once I was back onboard. In Jamaica, conch is popular in soup, curries and fritters. Nowadays, conch harvesting in Jamaica is seasonal, but 25 years ago our captain was pleased that his passenger had not only found a shell, but had provided his family with a nice meal. For those who don't know and because I hear it said wrong all the time, conch is pronounced "konk." This is what is left of a Horse conch (Pleuroploca gigantea) after many, many years in the ocean. I have no idea just how old it is, I'll leave that to the experts, but this is high on my list of favorites. To me, it's like a piece of sculpture that the sea created over time. Others would quickly pass by something like this in their quest for perfect specimens. I love how the areas that have been broken away, expose the inside intricacies of this beautiful shell. The spire and the siphonal canal are missing, but the body whorl is left exposed for us to see inside. 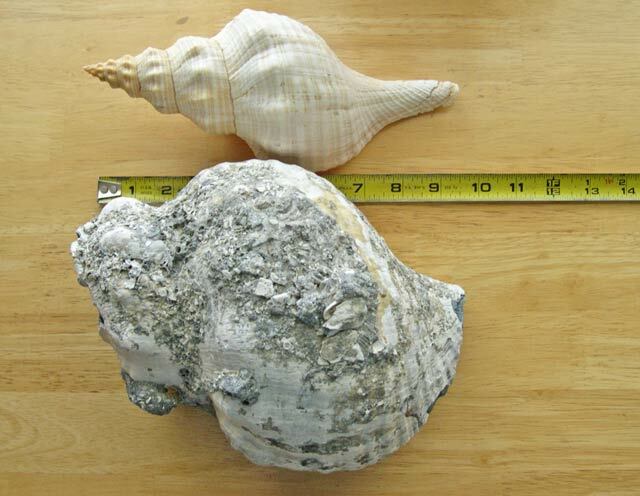 When they are young, Horse conchs are a bright orange, but as they become adults this color fades, eventually becoming the greyish white you see here. This inside is smooth and shiny like marble. The edges are rough, but have been smoothed enough to not be sharp. 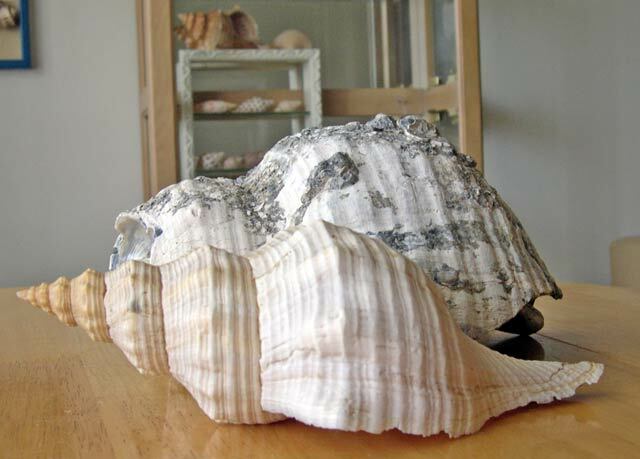 Horse conchs are the largest gastropod in the United States and can grow to be 24 inches. In a side-by-side comparison to another from my collection, you can see that this one must have been close to that. 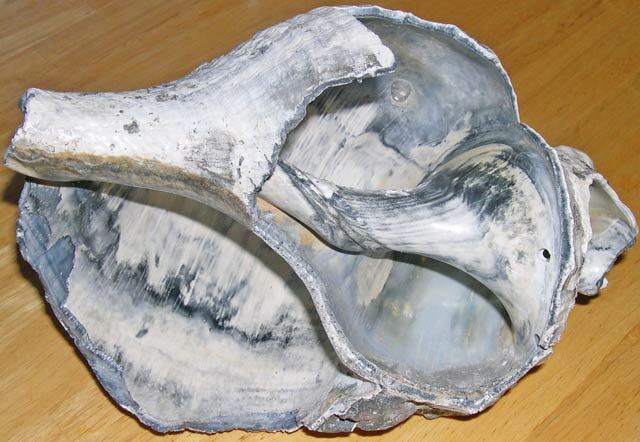 About half the outside is covered with sediment, including barnacles and bits of other shells. Again, this has been worn smooth. What do you think? Would you pick up a shell fragment like this? To me, it is as beautiful as my Queen conch. Now you can find broken shells all over the beach, but they're usually not anywhere near this size. Typically, you'd have to be skindiving to spot something like this. My acquisition of this masterpiece is the result of the storms and hurricanes that hit the Gulf Coast of Florida. In 1985, yes the same year I was in Jamaica, in fact, it was the week that included Labor Day weekend, Hurricane Elena made her erratic trek up the Gulf Coast. She just couldn't make up her mind where she wanted to go, so the predictions were all over the place. I had come out from California to visit my parents for a week before heading to Jamaica for ten days and then coming back to Florida before heading home. Nothing like having a hurricane mess up your vacation plans. I did make it to Jamaica on time, but not before Elena decided to sit about 80 miles offshore from Indian Rocks Beach, forcing us to evacuate for four days. Now you have to understand that I was vacationing and not paying particular attention to the weather reports, so mom and I were out shopping and lunching. We stopped at Wade's Seafood to buy shrimp and fish for dinner before heading back home. Elena was supposed to be headed to Mississippi and while that is where she eventually made landfall, she made a loop and headed back our way. We arrived back in time to find out the island was on voluntary evacuation and everyone was driving in the opposite direction from us! We quickly brought in the outdoor furniture and battened down the hatches, before heading inland to a hotel. Later that evening it became a mandatory evacuation. Thankfully most of our neighbors had already left, we don't fool around when it comes to hurricanes. Well, Elena sat out there for days, whipping up quite a mess onshore. Indian Rocks Beach residents were the last to be allowed to return and let me tell you, it was a mess. Luckily, our home was built to withstand hurricane force winds and the resulting flooding. Living quarters were on the second floor and the downstairs, as we found out, was watertight. Neighbors right on the beach and the intercoastal were not so lucky. Still, it was nothing compared to a Katrina-type storm. There was one thing that was missing though…the beach! I dug up some pictures to show you the difference a few days can make when a hurricane sits offshore. 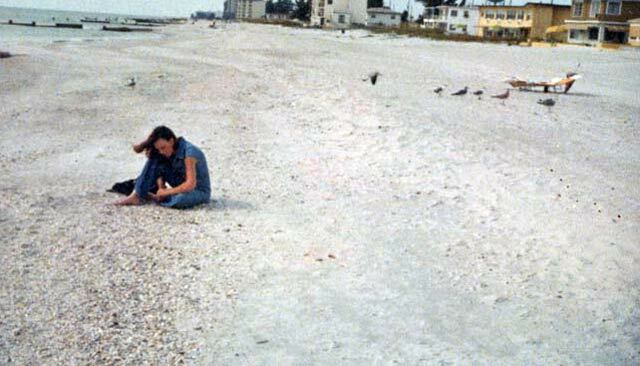 This first picture is me shelling back in 1979, the year my parents bought our home in Indian Rocks Beach. See the nice big expanse of beach? The sand was all swept out to sea and the waterline was now right at the seawall. Now you're probably wondering what all this has to do with my seashell. When this type of destruction occurs along the shore, the powers that be eventually come up with a plan for renourishing the beaches. If this is not done, the same area will suffer much more dire consequences when more storms pass through and in Florida and other Gulf states this is inevitable. 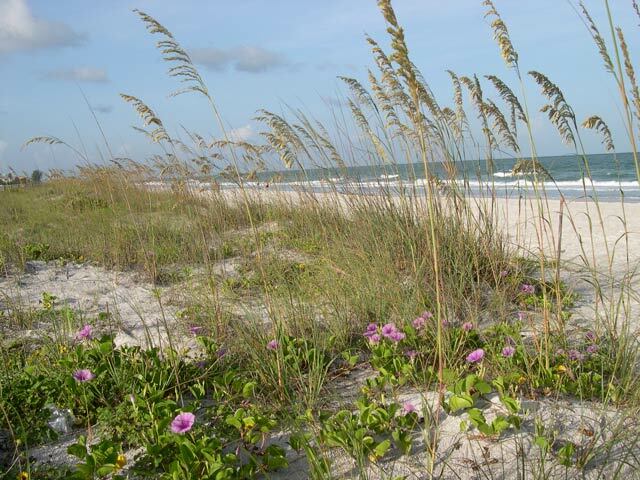 Florida is a tourist spot and without gorgeous beaches, that tourism will wither away. Sea turtles and birds who nest on these shores will not have homes to come to and breed. Did you know that sea turtles return to the beach where they hatched to lay their eggs? Cool, huh? So seven years later, in 1992 they started restoring our beaches and over the years this project continued to the north. 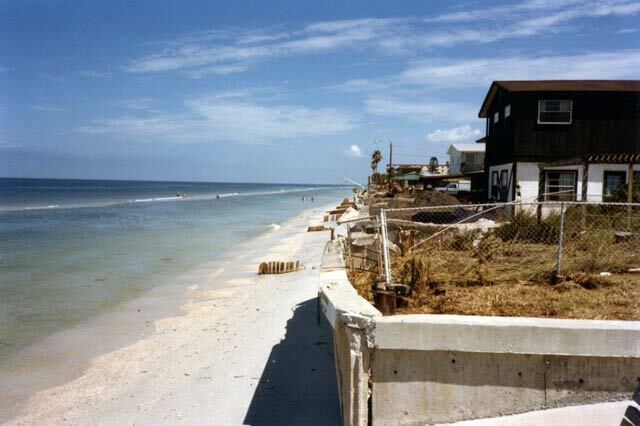 Sometime around 1995–96 they started pumping sand on Clearwater Beach. It was around this time that my friend Karen of The Essential Beachcomber and I hit the mounds. Yes, they go way offshore and dredge sand to build the beaches back up. Now what do you think can be found in this sand? Why seashells, of course! That is where I found my special seashell. 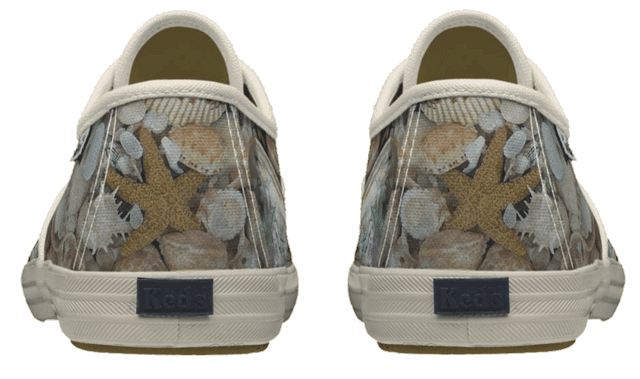 Yes, I design Keds for my Zazzle store and this is my personal favorite. They remind you of walking on a beach with every step. If your interested you can see them in my store here. Yeah, I guess you could say I'm obsessed. I hope you have a wonderful week. I know I've been absent a bit lately, I'm moving again!!!! Yes, over the weekend I went and found a house to share with two other folks my age. I think this is going to be a much better situation than the one here in Saint Marys. I've been lonely since my dog Sheldon passed away and having someone to share expenses with is a good thing. The house is gorgeous, with a full on gourmet kitchen and a fabulous backyard that includes an outdoor fireplace. My room is really tiny, that will be a challenge, but the rest of the house is glorious and I think I'll be much happier there. Plus, I'll only be about 30 minutes from my cousin Jackie, you know, the one who lives in Neptune Beach, Florida. Yes folks, I'm moving BACK to Flordia, Jacksonville to be exact. The neighborhood is GREAT and there are lots of restaurants and shops nearby. I'm moving at the end of the month, so I won't be doing a lot of posting for the next few weeks, I have to pack AGAIN! I will try to get out to visit all of you, but I'm doing most of this by myself this time. It's a drag when you move away from your friends and family, especially when you could use some help, lol. Take care, I will miss you, but it won't be long before I'm back! Love you all! My goodness, we have so much in common. I'm always excited about finding a perfect shell (it's harder here in Texas) but my favorite are the worn ones. 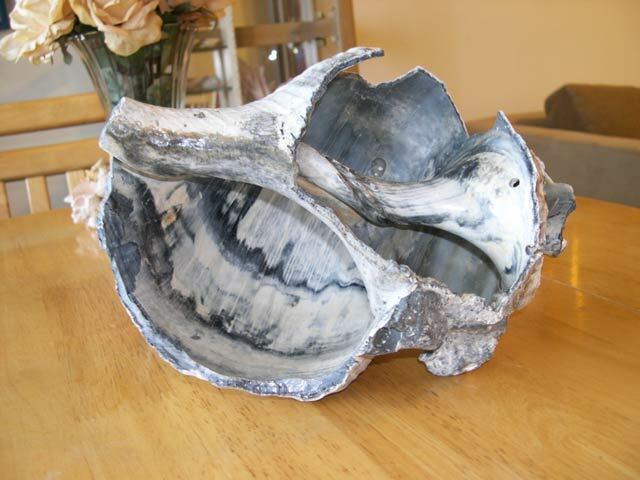 And like you, one of my favs is a very old queen conch that my Grandmother used as a doorstop. I have memories of it in her house in the late 50's, & it was already a very old shell. Beach replenishment is coming along in Galveston too, looking better all the time. But so much seaweed this year. Wonderful that you're moving back to Florida! Silly fingers, I wasn't finished. The shoes are sweet! I know a girl who will want a pair of those. I prefer the broken one by far. Those little shoes are too cool. Wow. I love shells also. I am always on the lookout for the broken one's. There is something about the 'life' it has led before coming into my hands that just amazes me. Enjoyed your information about shells and hurricanes. I hope your move is easy and you get settled soon and come back to post! Shell, I think I like the B/W the best. There's something simple yet complex about it. I had no idea there was so much to know about different kinds of shells. Wow!! And that picture of you shelling... breathtaking. You are one beautiful lady Miss Shellebelle!! Can you believe..., I did not know that conch is pronounced "konk." Okay..., lesson learned. 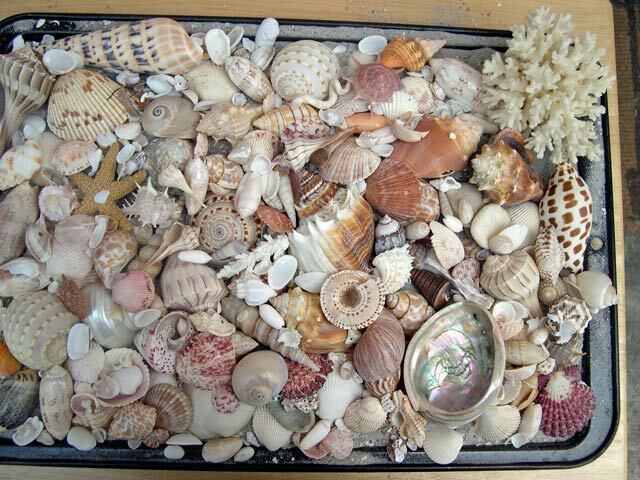 All these shells are so gorgeous!!! Sounds like your moving in the right direction!! I became a room mate once to a single woman back in Zurich (it was the fastest way to get into a new place after breaking up with my boyfriend)..., and she became one of my very best friends, in fact, she is the only friend I still have in my homeland! Wishing you the best..., and lots of muscle haha!!!! You are moving just a little bit closer...wonderful! I hope your new living quarters will be just what you want.And I hope your new roommates will become good friends to you. Like you, I love the old worn shells...and have many in my collection. I find their markings fascinating...the way they have been beaten by the waves, yet still strong. I love, love, love those shoes! Wishing you the best in new abode. As for the shells I had amassed such a collection of larger ones for quite awhile. One day I gave most of them away including a large conch from the Bahamas. I still have a smaller one and some that have been outside are literally bleached by years in the sun. Great post...!! I am also obsessed with seashells...I love all kinds - but like, I really like the vintage looking older, unperfect shells. Those are the ones I go for - most people leave them behind. I love looking at all the crevices and wear and tear wondering how old the shell is and where it traveled from. Your seashells are lovely. I like the conch a lot, especially the pinkish interior, it is such a lovely soft shade. I am happy that you are moving to a place that will make you less lonely. I know it must be so hard without Sheldon. Your soon to be new home sounds beautiful and a perfect place for a beautiful and sweet lady like you to live. I miss you and can't wait till you are back to blogging and all settled in. Good luck... how far are you from Disney?? We are coming down this Christmas and then going to the Palm Beach area. One day we will get together, Oliver and I are looking forward to taking you out on the town!! I loved this post, Rhonda! Such gorgeous shells and some neat shoes, too! Not only do I like conch shells, but I love conch fritters. Key West always had the best ones. Leaving in a few for Mayo. More details on my blog. Please keep Mr. Magpie in your prayers. I remember the 1st time we ever went shelling together. You had on a pair of khaki shorts with big pockets (before cargo's came in to style). You filled up your pockets to the point your drawers were hanging. I remember that shell too. You always see the beauty in every treasure you pick up either off the beach or at a garage sale. And THOSE SHOES ROCK! I love both of those gorgeous seashells, and I don't strive for perfect shells either! And living in a hurricane prone part of the country I can easily understand how quickly a landscape can change like in your photos! I love your cute shell shoes, what a great idea! Best of luck for a smooth move! I hope your new home will be just what you've been looking for! I'm happy you've found a new place where you will be happy...but I'm sad that you will be away from your blog for awhile. I will really miss you. Love the shells and the interesting information. I too love shells...maybe not as much as you though. I've always loved looking from them on the beach. Did I tell you I was given all my MIL's shells that she had collected and there are MANY. Her and my FIL used to go down to Darien when they were dredging there. Don't know what I will ever do with them but I just couldn't bare to let them go! I do hope you'll be happy in your new home. You'll have to tell us all about it and your new roommates. Oh...and, girl, you are just soooo talented! I am in awe! Good luck and hurry back! I love shells that have been worn away so the interior can be seen. I have several that I've found over the years. Yours is a spectacular specimen. I love the shoes, they are wonderful to remember the beachy days at the city.. I remember as a kid we were driving somewhere in Florida and came upon a building site...not yet started. There were mountains of sand, full of perfect huge shells. We filled bags with them, it was so much fun. I'm glad you will have roommates...there is something about having activity in the house. Jacksonville is a great town. Moving and packing again...ugh. I wish I were closer, I would come help! Ah! I am sorry to hear you are relocating again so soon! I hope it will work out better for you there. It sounds quite nice and promising. Be sure and give us a tour of the outdoor fireplace okay? I will send up a prayer for you, as I know it will be tough but I do think you are going to be just fine. Anyone who can create those very cute shoes to sell is quite adaptive! I didn't know you did that too! One day you will have to tell me what all you do! You are quite interesting! Your conch's are both awesome. I have only ever heard "konk" shell. I've never heard it mispronounced. That's too funny! I would have no idea what kind of shell someone was talking about it they pronounced it like it spelled. LOL! I can only imagine the look on your face when you do hear someone pronounce it incorrectly. So funny! Beautiful pictures, shells are like one of those wonders that God has created for us all to enjoy. When you're back in this neck of the woods, try and hit the beaches on Pass-a-Grill, was just there a few weeks ago, and I was surprised at all the shells, beautiful, and many different kinds...unlike I've seen in quite sometime. Take Care!!! I've been recovering from surgery for the last week or so and our internet was down for the entire time so I had no way to communicate...very frustrating. Anyway, I'm glad to catch up a bit and I wish you luck as you pack up and move back to Florida--Jacksonville, eh? I look forward to your next post!!! Hi Rhonda! You are so sweet gal! I even have some blue ticking, but it is denim blue. Do you think that would work? i had a notion to have an all coastal Etsy shop at one time. It could still happen! 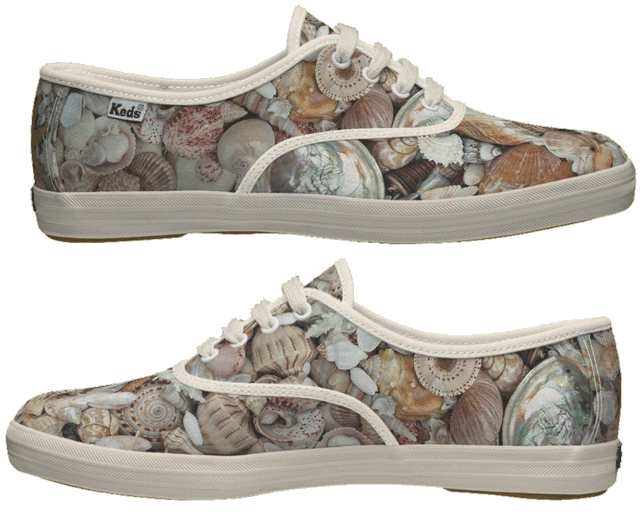 LOVE your shells, and those Keds...too cute! How did you even think of that!!!??? I am so amazed by the creativity of the women in blogland!! Praying that all goes well with your move! As I was watching those big waves I thought about erosion. I don't think it did much...thankfully. I'll have sand between my toes soon! oooh, I love the Horse conch shell! I have a conch shell from the Bahamas...I treasure it! OMG your moving again Rhonda! Well good luck my dear, it sounds like a good move. And your collection is just breathtaking! I remember how fun it was to collect shells when hubby and I were in Mazatlan on our honeymoon. I could have done it for days! And thank-you for the awesome note. It meant a lot to me and feel better because of it. Oh my do I have a lot of reading to catch up on! Don't even have time to read this post (although the pics are pretty! and I've similar disappearing acts by beachers around here... sad! ), but I just wanted to pop in and tell you I haven't turned into a fig newton! Even in the land of figs it's hard to get hold of good ones... but rest assured I'm eating as many as I can! ;o) update on my blog explains my current -very frustrating!- disappearing act. hugs and best of luck with the new change!!!! It's been a while and I just wanted to stop in to say hello. 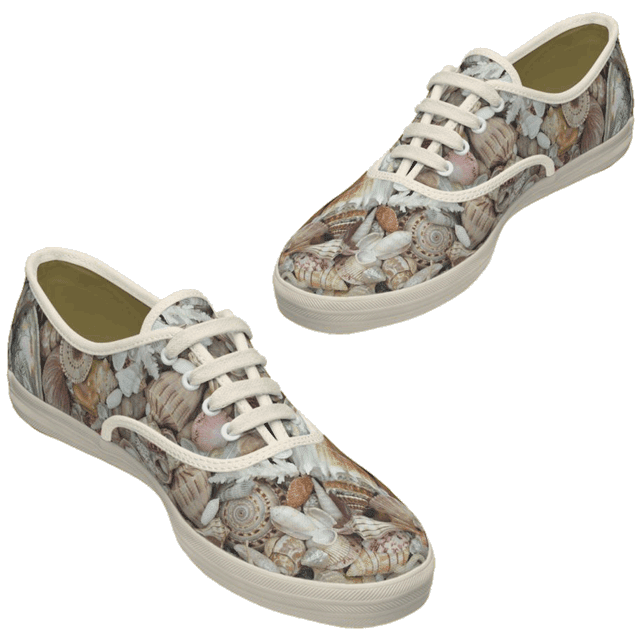 Your collection of shells is beautiful and those shoes are too cute! I hope your move goes well and you make a happy new home for yourself. I love those shoes! Yes, I pick up certain shell fragments. I too have heard so many people mispronounce conch. I only have two of my conch shells left. I am not sure where the others went. I hope all is moving along as you expect it to during this newest move. Checking in on you...hope you are okay! I just wrote you a long note, and of course, Blogger ate it. Grrrrr! I keep getting this thing that says, Service is not available." Then it swallows my post. I need to remember to copy it before I publish. Anyhow, love all your shells! Those shoes are just too cute, and I ageee about conchs and starfish. Those are two of my absolute favorites. Glad the move went well and that you are getting settled nearby. I'm getting ready to "muck the stalls" here in prep for some women from the garden club who are coming by to case the joint. ;-) They are getting ideas together for their tour of homes. Then I go to Central Florida this week. Sending you many hugs and much, much love. short and simple. We are not close. I have never spoken to you face to face although I would love to. The short and simple is I miss you! I hope all went well with the move and that you are getting it all together. Snow will be here soon. I miss the sea! Hi! Just stopping by to see if you have those boxes unpacked yet and are back here where we miss you!